Sometimes you just need to get away. Or maybe you already are on vacation and thinking of surprising your partner with something fun to do. Whether you are celebrating something special, planning a honeymoon or just looking for a couples getaway, allow MGM Resorts to recommend how to make this the best vacation ever in Las Vegas. 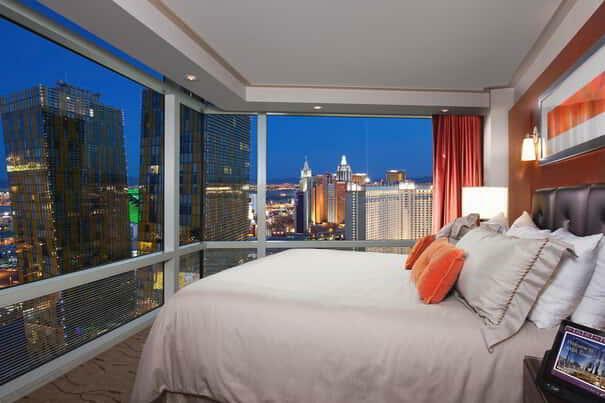 Choosing a suite with a view of The Strip can transform a fun vacation into an exciting memory. Don’t just book a room in Las Vegas. Impress the one you love and book a suite with MGM Resorts. If planning a honeymoon, we recommend the Cypress Suite at Bellagio, the Tower Spa Suite at MGM Grand, and Vdara Luxury Suites. The Cypress Suite, tucked away from the hustle of The Strip has large windows that make for incredible views while you enjoy your honeymoon stay. After a long night on The Strip, in the Tower Spa Suite, you both can unwind in the decadent, whirlpool spa tub. With unique amenities, complimentary Spa Facilities at Forbes Five-Star awarded ESPA, astounding views, and personalized service, the Vdara Luxury Suites encourages you to do Las Vegas on your own terms. 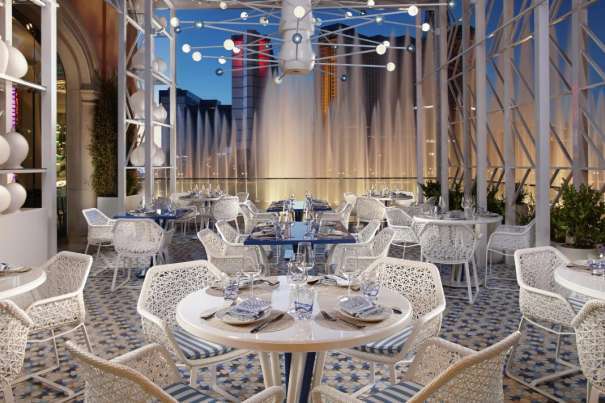 Tour the bolder side of Italy at LAGO by Julian Serrano. Featuring floor-to-ceiling panoramic windows, LAGO’s dining room ensures you will have the most spectacular views of the resort’s iconic Fountains of Bellagio. Newly opened at Park MGM, Bavette’s Steakhouse & Bar intimate space filled with glowing chandeliers, sultry jazz, rich woods, and red banquettes will transport you back in time when life was fun, simple and the liquor flowed freely. 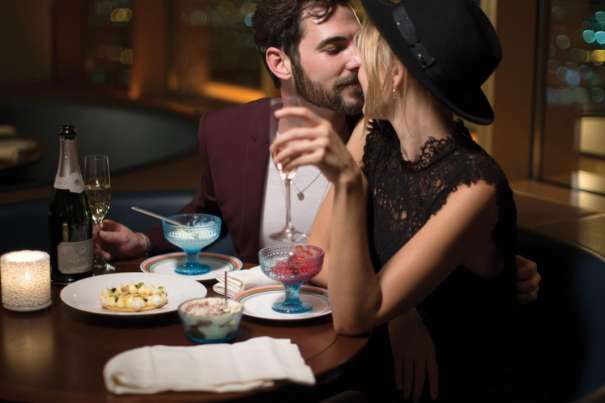 Afterwards, head over to the Skyfall Lounge, at the Delano Las Vegas where you can cuddle while viewing 180-degree views of the city and then dance the night away as DJs spin upbeat house and dance music mixes. Upgrade your experience and reserve a private VIP table on the lounge or outdoor patio and enjoy champagne and light fare. From provocative shows for couples to adult-only pools, MGM Resorts have some of the best adult activities in Las Vegas. We recommend Cirque du Soleil’s most-seductive Las Vegas show, Zumanity. “Putting a seductive twist on reality,” this is one of the best shows for couples to see while staying in Vegas. While taking in Zumanity, you will witness sensational acrobatics, naughty performances, burlesque stunts, and much more to heat up your date night. Zumanity promises a night of seductive performances that are uninhibited adult fun. Surprise your loved one with a couple's side-by-side full-body massage. This for sure will score major points with your partner. There is nothing better than experiencing true tranquility and relaxation while enjoying each other’s company. MGM Resorts spas offer a range of services for guests to enjoy. 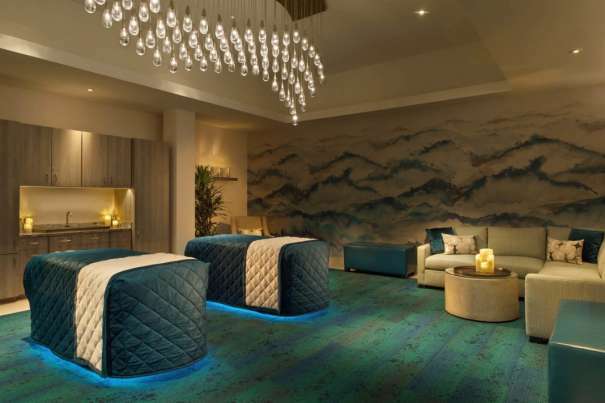 ESPA at Vdara is a five-star rated spa with two floors of pure relaxation. The Delano BATHHOUSE Spa will whisk your worries away with its Redwood sauna, cold plunge and eucalyptus steam room. The Spa, Salon & Fitness at Bellagio features a Women’s Spa, Men’s Spa and Co-ed Lounge in order for you to spend even more time relaxing with the one you love. If looking for some adventure on your couples’ getaway, check out some of the attractions that MGM Resorts offer. 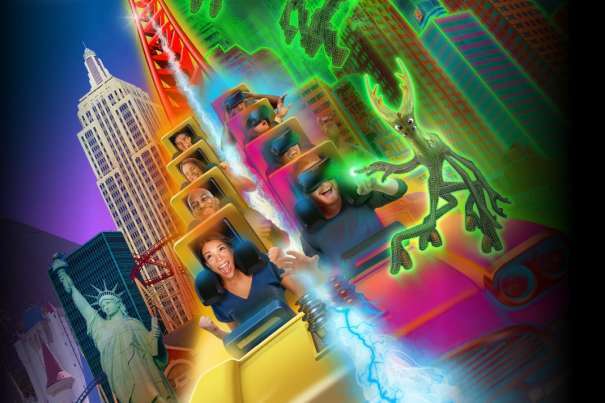 First, try the Big Apple Coaster Virtual Reality Experience where you all get to chase aliens in a 4-D ride high above the Las Vegas Strip while aboard the white-knuckle roller coaster. Close by at MGM Grand is Topgolf, a four-level golf entertainment venue with interactive golf games, climate-controlled hitting bays, hundreds of HDTVs, delicious food and more. Don’t leave Las Vegas without experiencing the city’s favorite dining show-The Tournament of Kings. This live-action production takes place in a 900-seat theater-in-the-round arena and immerses the audience in a tale of valor and treachery. Valiant knights ride mighty steeds and prove their chivalry amongst special effects and pyrotechnics. While knights fight, guests feast on a hearty three-course meal using the original utensil – their hands! Enjoy Las Vegas from the best view possible – the sky. 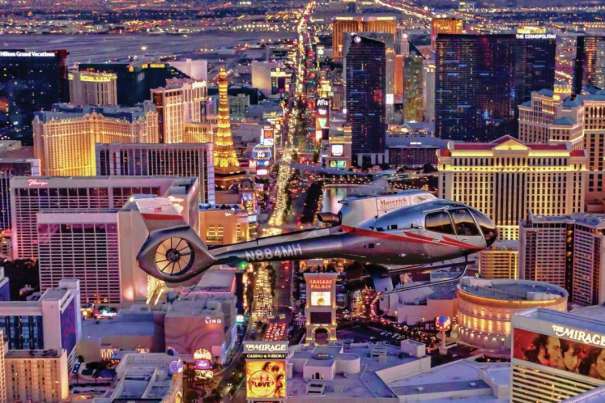 Soar high above the Las Vegas Strip as you witness iconic landmarks such as the Bellagio Fountains and The Mirage Volcano from the comforts of a luxury helicopter through Maverick Helicopters. Along with flying over stunning views of the resorts, both of you will be transported to the private terminal on the Las Vegas Strip via executive-style limousine coaches. Any MGM Resorts Concierge desk would be happy to assist with arrangements and is also knowledgeable with additional ideas on how to make your vacation memorable, so don’t be afraid to ask for suggestions for a fun night on The Strip!